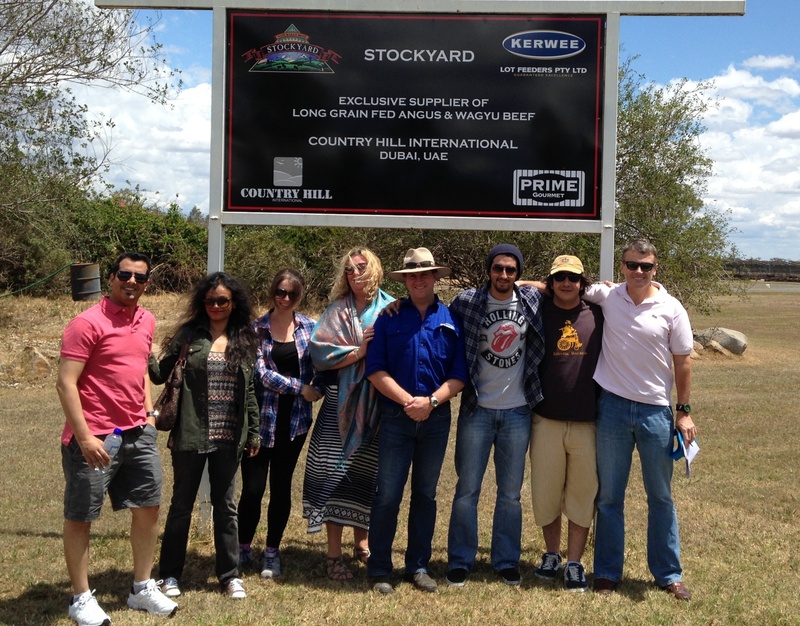 In late 2013, a group of industry journalists from the Middle East visited Kerwee feedlot as part of an education program conducted by Meat and Livestock Australia. The purpose of their visit was to research the Australian beef and lamb lotfeeding and processing industries, as well as to gain an appreciation of how these integrate with the food service sector. Their story starts in downtown Riyadh, Saudi Arabia. At the Al-Fursan butchery, head butcher Chris portioned a beautiful piece of Stockyard’s award winning Longfed Striploin into steaks. Chris was extremely familiar with the Stockyard name, having used our products extensively, and promised the journalists that the meat was “as halal as it gets.” This was a testament to the extremely high standards of halal certification in place in Australia, and the next step was to experience this first hand. After an extremely long journey to Australia, the journalists were taken on a tour of the Kerwee feedlot by our CEO, Lachie Hart, and shown how our cattle are reared and cared for. The group was shown how the cattle’s diets are segregated according to breed; and how each of these diets is made up of grains containing a complex and healthy mix of vitamins and minerals. The journalists were impressed by both the cutting edge technology used at Kerwee to track and record cattle details and movements (the SureTRAK system); and also the shade system using natural wind patterns to promote relaxation for the cattle, which was developed exclusively by the Kerwee Group. One of the overall main areas the journalists were interested in was understandably the halal certification process followed in Australia. Cattle welfare plays a primary role in the halal process, and the journalists returned to the Middle East highly impressed with the animal welfare systems in place at the Kerwee Feedlot. These same welfare systems were given ringing endorsement from respected animal welfare expert Dr Temple Grandin during her recent involvement with BeefWorks 2013, held at the Kerwee Feedlot in October.